Right about three weeks remain in the NBA regular season. Barring something unforeseen, the eight playoff teams in each conference appear to be pretty safe, but the seeds are up for grabs from top to bottom. What follows is everything you need to know about where things stand entering Tuesday, March 19th. Teams are listed in order of current seed, with the projected finishing seed below. This post will continue to update for the remainder of the season as we keep track right down to the wire. NOTE: Our SportsLine model, developed by predictive data engineer Stephen Oh, simulates the entire season 10,000 times to produce the most unbiased and precise projections imaginable. 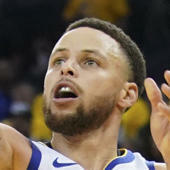 The Warriors, who have already clinched a playoff spot, lost to the Spurs on Monday night to fall into a tie for the No. 1 seed with the Nuggets, who beat Boston. Golden State currently holds the tiebreaker with Denver via a 2-1 head-to-head advantage. The teams still have one matchup remaining, and if Denver were to win, the tiebreaker would get really close as both teams are division leaders (the second tiebreaker) and have virtually identical conference records (the third tiebreaker). Our SportsLine projections still favor Golden State to win the No. 1 seed, largely because of the difficulty of Denver's finishing schedule. As mentioned above, Denver, who has also clinched a playoff spot, beat Boston Monday night and is now tied with Golden State for the No. 1 seed. Golden State still owns the tiebreaker via their 2-1 head-to-head advantage, but the teams still have one game remaining. Golden State's schedule is much easier down the stretch. The Rockets have won 11 of their last 12 and look to be playing their best ball of the season at the perfect time. The race for No. 3 is big because it would mean avoiding the Warriors -- assuming they finish with the top seed -- until the conference finals. Our data model favors the Rockets to stay in that spot. The Blazers have won four of five as they inch closer to securing a top-four seed, though that is far from finished with the Spurs, Thunder and Jazz all within two games of Portland in the loss column. Home-court is nice, but again, assuming Golden State is able to secure the No. 1 seed, getting to the No. 3 seed would be huge for Portland. That would allow the Blazers to avoid the Warriors and potentially the Rockets through the first two rounds. The Spurs, after a big win over Golden State Monday night, are currently the No. 5 seed, but you'll see our SportsLine projections have them finishing as the No. 6 seed behind Utah. That's largely because Utah owns the tiebreaker over San Antonio. The Thunder have fallen from the No. 3 seed to the No. 6 seed, and our SportsLine projections have them falling even farther by season's end thanks to the league's fourth-toughest remaining schedule. The good news is OKC's remaining schedule is home-heavy and they own the tiebreaker over Houston, Portland and Utah. The Jazz, winners of four straight, have gone from a four-percent chance to earn a top-four seed to better than a 32-percent chance. Despite having the league's softest remaining schedule, our SportsLine projections don't have Utah quite cracking the top-four, but they do have them jumping from their current No. 7 seed to the No. 5 spot by season's end. The Clippers are pretty safely in the playoffs because the Kings, at No. 9, have all but fallen out of the race. Entering Tuesday, the Clippers have a five-game lead in the loss column over Sacramento, which is effectively a six-game lead because the Clippers own the tiebreaker. The Bucks have clinched a playoff spot and are now aiming for the No. 1 seed both in the East and overall. It's looking pretty good. The Bucks lead the No. 2 Raptors by three games in the loss column and also own the tiebreaker. The Raptors have the second-easiest schedule coming down the stretch but they're just too far back of the Bucks to have a very realistic chance to catching them for the No. 1 seed. Interestingly, if somehow Indiana finishes as the No. 3 seed, the Raptors would actually benefit from being No. 2 as it would mean avoiding Milwaukee, Philadelphia and Boston through the first two rounds. If the Pacers stay at No. 4, where they are now, that scenario becomes moot and Toronto would face Philly in the second round if current seeds hold. The Sixers have clinched a playoff spot but have a ways to go to secure a top-four spot. Their upcoming game vs. Boston will be big, a win would get them a lot closer to sealing a top-four spot as right now Boston's hope of catching Philly rests on the Celtics' owning of the tiebreaker. Philly has already lost that, but distancing themselves further makes that tiebreaker less valuable. Philly has a favorable schedule down the stretch, though it's road-heavy. The Pacers have clinched a playoff spot and are currently sitting in the No. 4 spot. Our SportsLine projections like them to hold off the Celtics and stay there, but it's slim. Entering Tuesday, Indiana leads Boston by just one game in the loss column and they have two head-to-head matchups remaining. Those games will very likely determine the No. 4 seed, and thus, home-court advantage in a 4-5 playoff series between these two. As mentioned above, Boston trails Indiana by one in the loss column entering Tuesday, and they still play each other two more times. At this point in the season, that one game lead is enough to make Boston, despite having an easier overall remaining schedule, the underdog to catch Indiana. That said, they control their own destiny. Win their final two games against the Pacers and they will very likely get that No. 4 seed. The Pistons have a two-game lead in the loss column over both Brooklyn and Miami. Brooklyn's schedule is brutal and Miami has played two fewer games. The Pistons don't own the tiebreaker against either of those teams, but the two-game lead is enough for our projection model to keep them in the No. 6 seed. The Nets are currently the No. 7 seed and our SportsLine projections have them falling to No. 8 by season's end. Brooklyn's closing schedule is murder. The Nets aren't assured of a playoff spot with just a two-game lead in the loss column over No. 9 Orlando going into play Tuesday night. The good news is the Nets do own the tiebreaker, so that lead is effectively three games. The Heat are currently the East's last team in at No. 8, but projections have them jumping Brooklyn for the No. 7 seed by season's end. They're a good bet to hold off Orlando for a playoff spot, but that will change if the Magic win their remaining game vs. Miami on March 26th. Orlando is two games back in the loss column of the final playoff spot entering Tuesday. Projections suggest they have the best chance of catching Brooklyn, but they also have a head-to-head matchup with Miami remaining that could go a long way.